Babies can't tell you how they slept or if their diaper was damp. Ordinary diapers can stay damp, but Pampers are drier faster. For up to 12 hours of undisturbed sleep and nothing but happy babbling mornings. 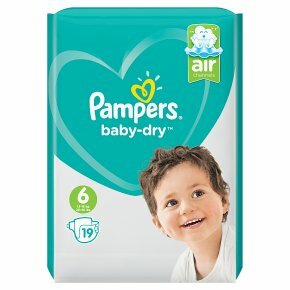 Pampers baby-dry nappies with unique Air Channels for overnight breathable dryness. An Extra Dry-Layer to help distribute wetness evenly and keep it away from baby?s skin. An absorbent core with Micro Pearls to lock away wetness. For up to 12 hours. Stretchy sides provide a comfortable fit for great overnight leakage protection. A soft like cotton top layer next to baby?s skin (does not contain cotton). Fun exterior graphics to enjoy our fun designs & characters with your baby. Want to know more about the components Pampers uses? Visit pampers.co.uk, pampers.ie. Air channels for dry bottoms with Pampers baby-dry nappies. As a parent you understand the importance of fresh air against your baby?s skin, which is why you may like to let your baby have some nappy-free time during the day. Pampers baby-dry nappies create space for air to flow freely inside the nappy, giving your baby that fresh air feeling. With up to 12 hours of Breathable Dryness, your baby?s bottom stays dry throughout the night for a comfortable sleep. Use with Pampers wipes.